By Kellytoy. Soft & Cuddly. 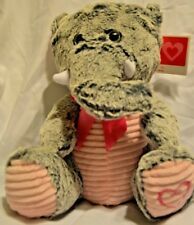 Gray & Pink Elephant Valentine Stuffed Plush. 20" Kellytoy Brown Bunny Rabbit with Green Ears.